In the coalition agreement of 1 December 2011, it was stated that directors and members of management boards are not entitled to stock options, free shares, bonuses or any other benefit if their financial institution receives governmental support. In various large Belgian banks no such benefits were granted to the members of the management board, therefore. In the next few years also, the bonus policy will be subject to tough conditions. Any additional bonuses, for instance, and we mean here the extras on top of the customary salary, not the variable remuneration that for example people with a sales profile receive, must be paid over a certain amount of time. Moreover, they may not be granted based solely on financial criteria, but an important criterion will also be customer and employee satisfaction. In addition, performance that is remunerated must also be tested in terms of sustainability and linked to long-term results. A number of institutions has implemented so-called claw back systems on a voluntary basis: Board Members and specific senior managers are paid bonuses, if any, which are not just spread in time, but their reimbursement may also be demanded if the results appear not to justify them in the long term. For 74% of the sector (4 out of the 19 institutions surveyed), half the remuneration committee is made up of independent directors. For another 18% (10 out of the 19 institutions surveyed), there is at least one independent person. 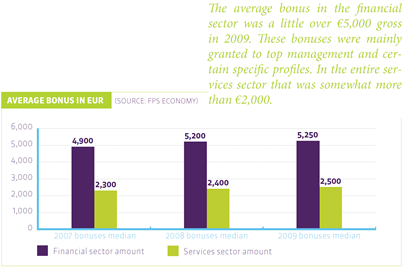 Compared with the salaries that the highest management members of financial institutions receive abroad, the Belgian salaries are much lower. As a result the differences in earnings in the Belgian financial sector are smaller than abroad because the Belgian financial institutions pay all their employees significantly better than the average in the services sector. This does not mean, however, that there is no pay gap. The difference between the remuneration of a manager and a front desk employee is significant. The remuneration system is also discussed at regular intervals at the level of the sector and the trade unions.